Would you like a car that talks to you? I would say that sounds like an interesting proposition. A huge fan of American television series Knight Rider, I rather fancy the idea of a car like KITT, replete with fascinating personality and self-driving capabilities, for days when I am simply not up for being in the driver’s seat. While the latter characteristic is some way away, Mercedes-Benz has made the former more of a possibility with its Mercedes-Benz User Experience (MBUX) infotainment system, which is available only for its new A-Class. The MBUX system is unique for its ability to learn, thanks to artificial intelligence — the system can be individualised for its user and will adapt to him or her over time. It thus creates an emotional connection between the vehicle, driver and passengers. 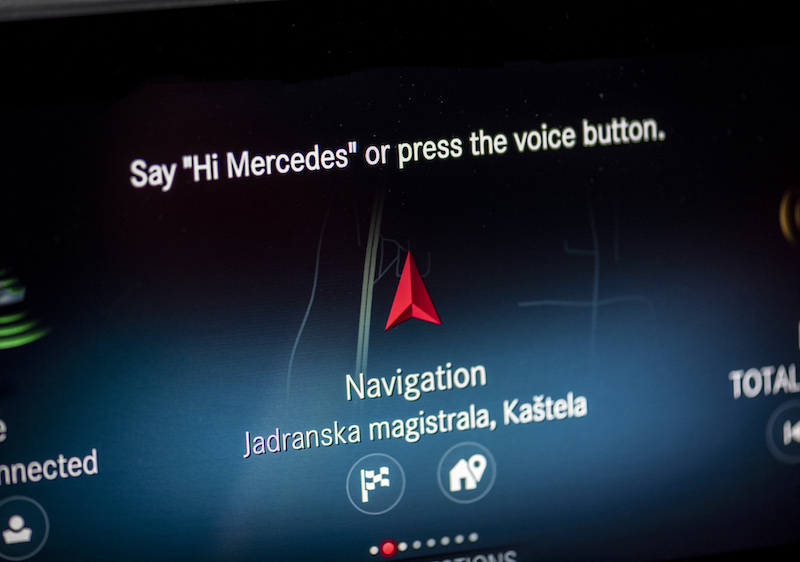 Operated via a high-resolution Widescreen Cockpit with touchscreen operation, its complete package includes navigation display with augmented reality technology plus intelligent voice control with natural speech recognition, which is activated with the keyword “Hey, Mercedes”. 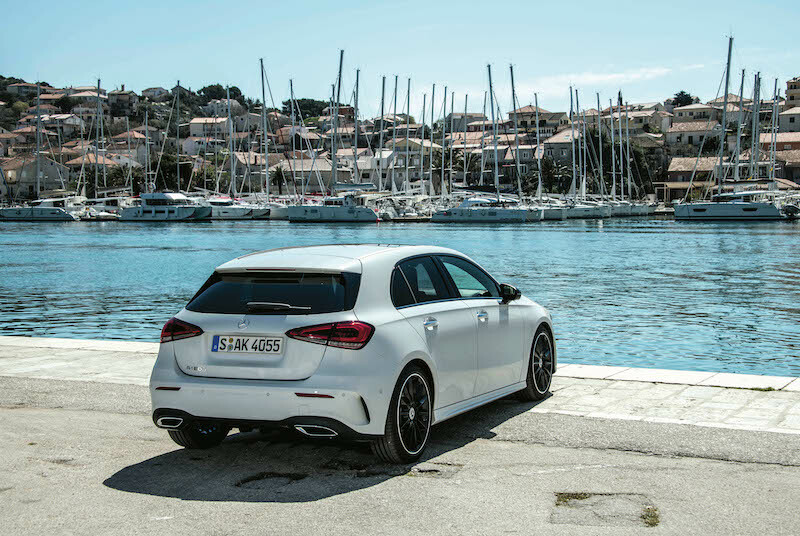 The global launch of the new A-Class was held last year in Croatia, which in the summer months is exceptionally pleasant — blue skies, sunsets that go on till 9pm and a crisp coolness in the air. The roads that snake across this European nation are narrow and winding, which is a great way to test the handling of the car — spoiler alert: there were zero complaints. It was quite a treat for us to traverse unspoiled countryside that extended for miles and miles, and our drive included stunning vistas of the Adriatic coastline and buildings left behind from the Romantic and Gothic periods in Trogir and Split. From our base at the Brown Beach House, our drive also made pit stops at the gorgeous Barone Fortress in Šibenik and Golden Rays Villas in Primošten. It is rather apt that the revolutionary MBUX is introduced for the first time in the A-Class, Mercedes-Benz’s entry-level segment and undeniably its most youthful. Recent versions of this sub-compact car show a marked evolution from the models that debuted in the late 1990s, which were taller and boxier. The third generation A-Class is sportier and much larger, making it ideal for small families as well as singletons who enjoy a bit of pep in their four-door vehicles. But despite its sportier look, the new A-Class is more practical and “grown up” than its predecessor. Notable plus points include greater shoulder, elbow and headroom as well as easier access to the rear compartment and considerably larger boot space. Even the all-round visibility has been drastically improved, which adds to the safety factor and the feeling of spaciousness in the cabin. In many ways, the A-Class orients itself in the luxury car segment — for example, the multifunction steering wheel is taken from the S-Class, as are the front seats in the form of seat climatisation and massage functions. 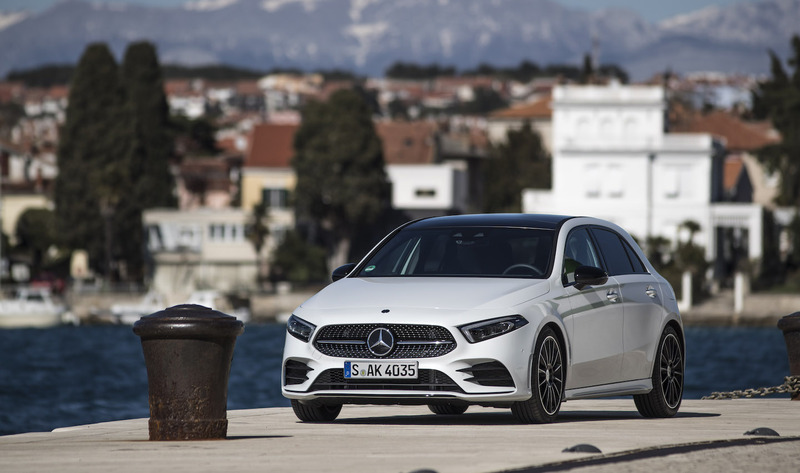 More importantly, the A-Class has inherited many of the latest-generation driving assistance systems from the S-Class, which assures that it has the highest level of active safety in its segment. This includes Active Blind Spot Assist, Active Lane Change Assist and Active Emergency Brake Assist. Parked under the sunshine in front of the Brown Beach House, the car allowed us a proper look at its shape and style. Embodying the next stage of the Mercedes-Benz design philosophy of sensual purity, it has the potential to spark a completely new design era. The stretched side line is courtesy of a lengthened wheelbase while the bigger wheels give the car a firmer stance on the road. The broad rear end looks modern and sleek while the progressive front-end design with its low-drawn hood and slender LED headlights make for a sporty appearance. 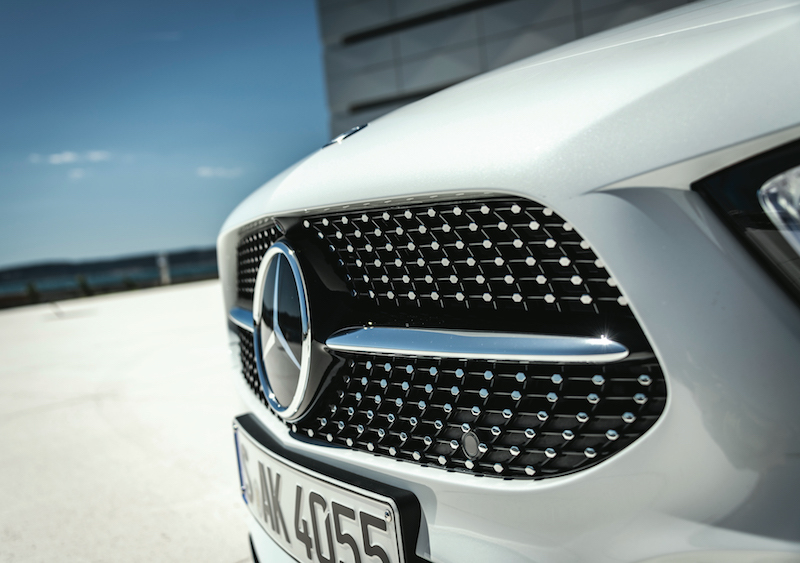 The look is completed by the sloping silhouette of the radiator grille, diamond-look pins and the central silver-coloured fin. Combining Mercedes-Benz’s signature appearance and feel with a youthful vitality, it is quite gorgeous to look at. While its exterior design is sleek and sporty, its interior is 100% modern luxe — a unique architecture resulting from the avant-garde styling of the dashboard. Although it looks a little complicated in pictures, I found the dashboard easy to navigate. It is divided into two horizontal entities, so to speak, separated from the main body of the instrument panel by a visual “ditch”. Therefore, it appears as if it is floating. The ambient lighting, which is optional and rather worth the investment, intensifies this effect and underscores the floating impression of the lower section. The two screens of the Widescreen Cockpit are free-standing (I love that the hoods over them have been abandoned) and a further highlight is the turbine-look air vents, which can also be illuminated. The cars we got came with the full kit and driving really was a heightened experience with the ambient lights on. Such interiors ask for suitable music to accompany the drive, and so we asked Mercedes for help. We are pleased to report that the MBUX system complied with our request for everything ranging from mainstream stuff by Michael Jackson to the obscure 1980s music from the likes of Soft Cell. Although we did not have much time with the MBUX, it seemed to be a pretty nifty thing to have in a car — there is little we can say against a personalised user interface system that is capable of learning and adapting to the owner of the vehicle. Additionally, the software models on the server learn new buzzwords and adapt to the changing use of language with time. The system also gradually ceases to answer stereotypically, and varies in the dialogue output, too. But what good is a car that talks to you if it does not drive well? Fortunately, Mercedes-Benz does not let us answer this question because the A-Class provides an exceptional driving experience, combining brilliant handling and just enough power for a car of this size. The A-Class models are equipped with new, efficient engines — you can choose from the 120kW (163hp), 1.4-litre M 282 in the A200 or the 165kW (224 hp), 2-litre M 260 in the A250. The engine of the A250 is lively, capable, reasonably refined and equally willing to rest or rev. This is the one I would have taken home if KL was not quite so taxing a drive from Croatia. I was slightly less impressed with the A200 — I prefer way more power — but I would imagine it works very well in suburban settings for school runs and dashes into the city. Although it is not available in Malaysia, we got to test the A180d — it is quiet for a diesel-powered car, but overtaking on highways would certainly pose a challenge. The seven-speed DCT transmission does a smooth and attentive job, and when taking corners, the cars feel like their older and more luxurious Mercedes-Benz brethren — solid, comfortable and trustworthy. Although the baby of the marque, the A-Class is emerging as a bit of a star for its uncomplicated and simple driving experience, and, of course, the wow-inducing connectivity that comes with the MBUX system. With an on-the-road price of RM227,888 (A 200 Progresive Line) and RM263,888 (A 250 AMG line), the A-Class is an easy way to get acquainted with this luxury German marque and a brilliant taste of what it is like to drive a well-engineered, class-topping compact car. This article first appeared on Jan 21, 2019 in The Edge Malaysia.